A new stratigraphy for bimodal Oligocene flood volcanism that forms the volcanic plateau of northern Yemen is presented based on detailed field observations, petrography and geochemical correlations. The >1 km thick volcanic pile is divided into three phases of volcanism: a main basaltic stage (31 to 29.7 Ma), a main silicic stage (29.7 to 29.5 Ma), and a stage of upper bimodal volcanism (29.5 to 27.7 Ma). Eight large-volume silicic pyroclastic eruptive units are traceable throughout northern Yemen, and some units can be correlated with silicic eruptive units in the Ethiopian Traps and to tephra layers in the Indian Ocean. The silicic units comprise pyroclastic density current and fall deposits and a caldera-collapse breccia, and they display textures that unequivocally identify them as primary pyroclastic deposits: basal vitrophyres, eutaxitic fabrics, glass shards, vitroclastic ash matrices and accretionary lapilli. Individual pyroclastic eruptions have preserved on-land volumes of up to ∼850 km3. The largest units have associated co-ignimbrite plume ash fall deposits with dispersal areas >1×107 km2 and estimated maximum total volumes of up to 5,000 km3, which provide accurate and precisely dated marker horizons that can be used to link litho-, bio- and magnetostratigraphy studies. 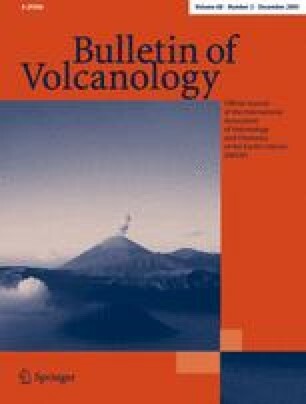 There is a marked change in eruption style of silicic units with time, from initial large-volume explosive pyroclastic eruptions producing ignimbrites and near-globally distributed tuffs, to smaller volume (<50 km3) mixed effusive-explosive eruptions emplacing silicic lavas intercalated with tuffs and ignimbrites. Although eruption volumes decrease by an order of magnitude from the first stage to the last, eruption intervals within each phase remain broadly similar. These changes may reflect the initiation of continental rifting and the transition from pre-break-up thick, stable crust supporting large-volume magma chambers, to syn-rift actively thinning crust hosting small-volume magma chambers.